All Springdale homes currently listed for sale in Springdale as of 04/23/2019 are shown below. You can change the search criteria at any time by pressing the 'Change Search' button below. If you have any questions or you would like more information about any Springdale homes for sale or other Springdale real estate, please contact us and one of our knowledgeable Springdale REALTORS® would be pleased to assist you. "Magnificent architectural and engineering masterpiece perched on a bluff above the Virgin River, just 1 mile from Zion National Park. Rarely used, it shows like new! No expense was spared in the construction and furnishing of this showplace home. 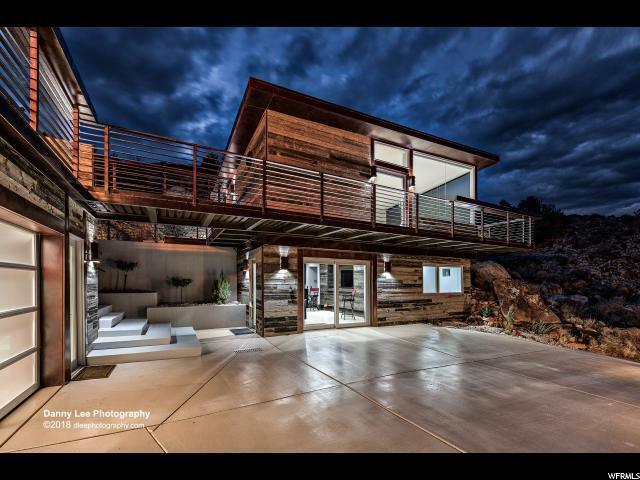 For the truly discriminating Buyer who desires ''the best'' in Southwest Living this is your opportunity to purchase one of the most masterfully created homes in Southern Utah. 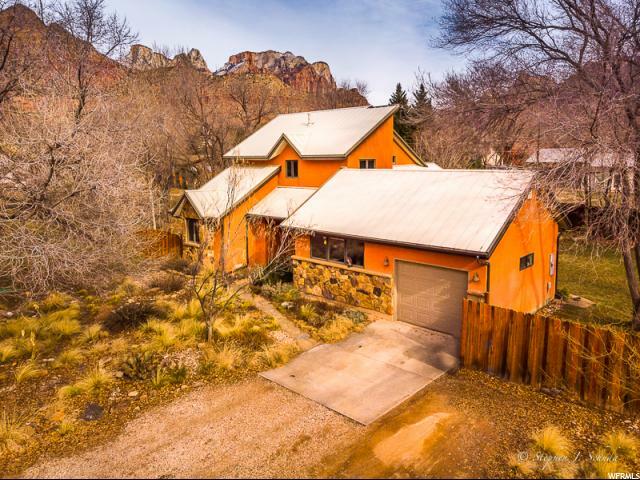 Enjoy this move in ready 3 bedroom, 3 bath Hi-Tech home with geo-thermal heating and cooling full-house stereo, Viking/SubZero appliances, custom cabinetry, hand-carved wood and travertine flooring all within walking distance of restaurants, shops, and Zion National Park. All furnishings you see in this home are included. Furnished and decorated by the IDS 2016 Interior Decorator fo the Year." "Feel the pull to toward the unique? Leave commonplace behind and separate yourself from the status quo. The road less traveled holds treasures that you must see to believe. 101 is not just a home but an experience in thoughtful, conscious living. Are you ready for a simpler lifestyle, filled with more life-style, surrounded by nature? " " Live in the shadows of the majesty of Zion National Park while tucked away on a quaint street. Three to five minutes to downtown. Walk or ride bikes to the best restaurants, only a few minutes walk or bike ride to everything. Only minutes to City park, Zion Park entrance, library/ Community Center and River Park. Custom built home original owners. Towering mountain views, mature trees, granite kitchen counter, hardwood & slate flooring, restored antique claw foot tub, Jenn-Air, Kitchen Aid and Frigidaire includes fridge. Open loft with wood beams and vault architecture. Cool basement for summer months, fully fenced with sprinkler garden area. Big windows offer both views and a lot of light. Plumbed fireplace area, thermostat pellet stove, share irrigation water, $45.00 yearly. 2,000' peaks tower above home, views of West Temple, Johnson, Bridge and Watchman. Track lighting for artwork and photographer dark room. Buyer to verify all information, deemed reliable, however buyer to verify all info including utilities & HOA information if applicable." 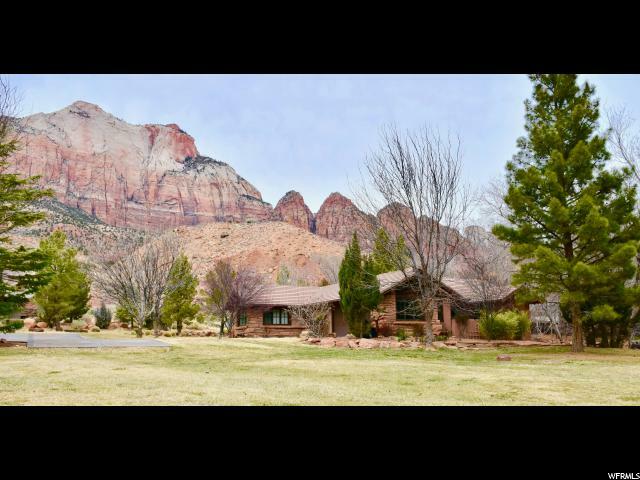 "Foothill living in Springdale surrounded by cliffs of Zion National Park. 3 bed/3 bath home has two ensuite bedrooms open to patio facing Zion views. New sunroom has custom crafted wet bar. Updated Kitchen with island cooktop. 1 bed/1 bath Casita can be used as a studio/workshop. 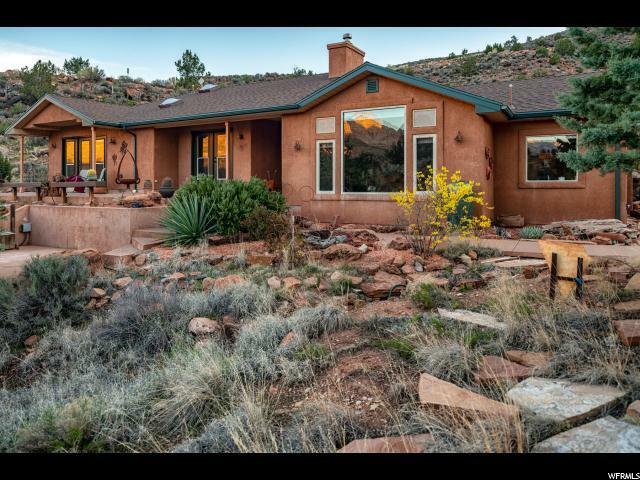 Two acres naturally xeriscaped with mature native junipers and massive boulders on private street with no HOA! Privacy, views and multiple living areas make this a wonderful primary or secondary residence. " 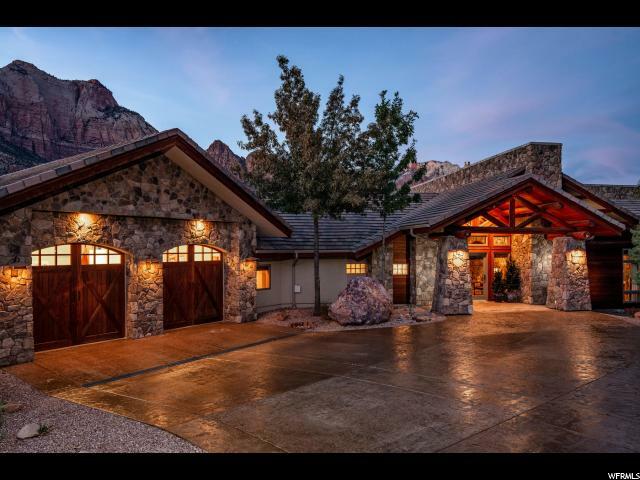 " A custom designed home, within walking distance from entrance of Zion National Park. Original owner, this home has been well cared for. Features 2 porches, 2 patios, oak random plank flooring, geothermal heating and cooling. Private neighborhood."